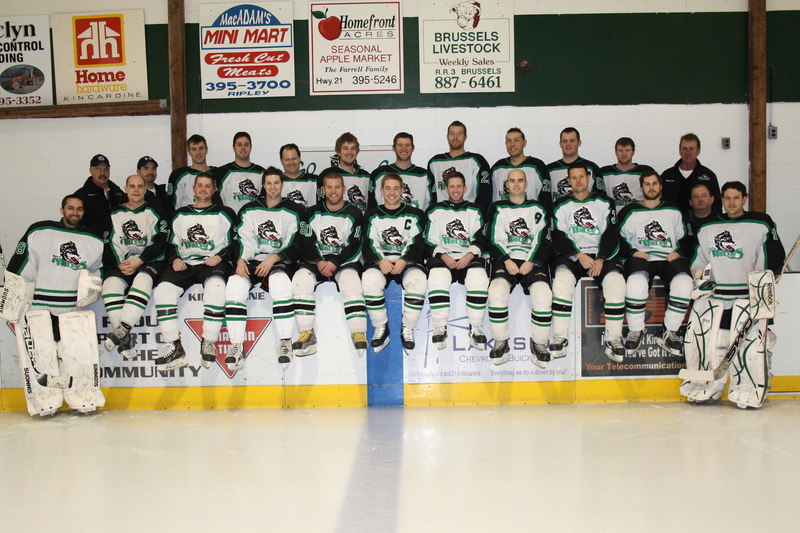 Although they would have loved to have upset the North Division leaders, the Ripley Wolves’ season ended on Friday night with a 7-3 loss in Elora. This capped one of the most exciting seasons in recent memory, and showed the WOAA Sr. A Division that Ripley is an up-and-coming team with an excellent balance of veterans, youth, skill and toughness. The Wolves players and the executive committee thank our sponsors, game volunteers and fans for supporting us this season. We look forward to an even better 2013-14 season and hope you will too. The Ripley Wolves put up another good fight, but came out on the short end of a 5-2 score in Game 3 of their semifinal series against Elora. The Rocks held a 2-0 lead in the second period when Nathan Gavey got Ripley on the board, from Devin Kemp and Curt Robinson. The only other Wolves goal was a short-handed, unassisted marker by Nick Locking, who has been superb in these playoffs. After leaving last Saturday’s game with a lower body injury, Kurt Edwards returned to the Wolves net Friday night. Saturday night is a big night at the Ripley arena, as the hometown Juveniles play the second game of their OMHA semifinals vs Lambton Shores at 6 p.m., followed by Game 4 of the Wolves/Elora series at 8. The Juvies lost Game 1 of their series by a similar 5-2 score, and look to get into the win column in front of what is sure to be a big crowd tonight.